Today in this post I will tell you how you can add Email Subscription Box in your Blogger.com blog. Email Subscription Box lets your reader subscribe to your blog via email, they will get daily emails in there inbox o your blog post. By adding Email Subscription Box, it will also help you in increasing your blog readers. Now if you go to your blog and see you will able to find a box where it will ask you to type email address, Click here to see live demo box. If you didn’t like that default design by Google and you want something different then you can try a design by FeedBurner and you can even customize it as you want. Now if you go to your blog and see you will able to find a box where it will ask you to type email address. Here is a live demo how it will look like, width will auto change according to your blog. 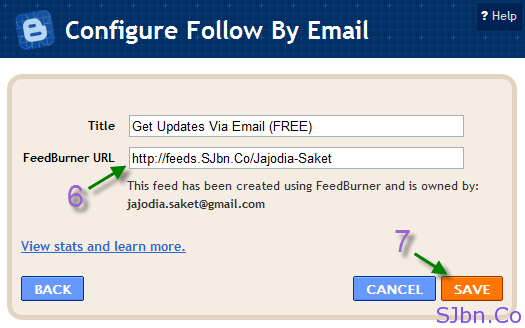 If you want to manage when your email get delivered to your readers just go to FeedBurner.com –> click on your feed name –> Publicize –> Email Subscriptions from there you can mange everything.